Life is better with surprises. Marshalls offers you a surprising selection from your favorite brand names anddesigners for ladies, men’s, kids and home, all for way less than department store prices. W ith our savings, your gift card goes twice as far. Your surprise is waiting. 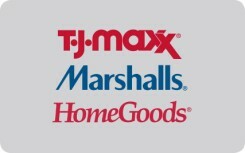 The TJX Gift Card is redeemable at Marshalls, T.J.Maxx, tjmaxx.com, and HomeGoods (in the U.S. and Puerto Rico). Marshalls, T.J.Maxx, and HomeGoods are not affiliated with Swagbucks and are not sponsors or co-sponsors with this promotion. Use of T.J.Maxx, Marshalls, and HomeGoods’ names, logos, images, or trademarks require written approval from TJX Incentive Sales, Inc. Participation by T.J.Maxx, Marshalls,and HomeGoods in the program is not intended as, and shall not constitute, a promotion or marketing ofthe program by T.J.Maxx, Marshalls, and HomeGoods, The TJX Companies, Inc, or any of its subsidiaries or affiliates.